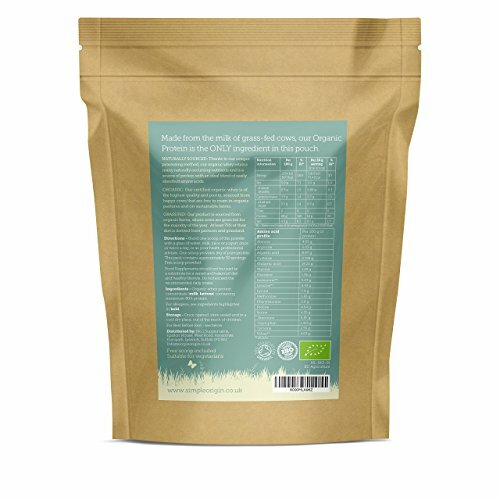 Organic Whey Protein Powder 1kg with Free Scoop & Money back Guarantee Included – manufactured in Holland from organic milk from grass-fed cows – unflavoured, Unsweetened Protein shake – PROTEIN POWDER not capsules, bars or tablets – supporting optimum nutrition and muscle mass – Suitable for men & women. Simple Origins whey protein has been made for those who want to maintain, muscle mass, and bone density. We guarantee a certified organic product of the highest quality and purity. Click the Add to Basket button above to experience this for yourself! GRASS FED: our product is sourced from organic farms, where cows are grass-fed for the majority of the year. Our Protein contains no sweeteners, flavourings or soy and has been minimally processed to give you the purest protein available. With our 1kg bag, you get a FREE SCOOP INCLUDED!